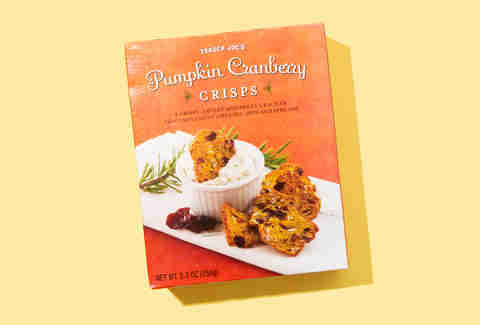 Nothing is certain other than death, taxes, and Trader Joe’s having a truckload of pumpkin-flavored food every fall. Only one of those things fill us with joy every time we encounter it, so if you’re looking for a story about death and taxes look elsewhere, hombre. But if you’re looking for a rundown of the best pumpkin stuff you’re going to find at (almost) everyone’s favorite specialty grocer, this story is for you. 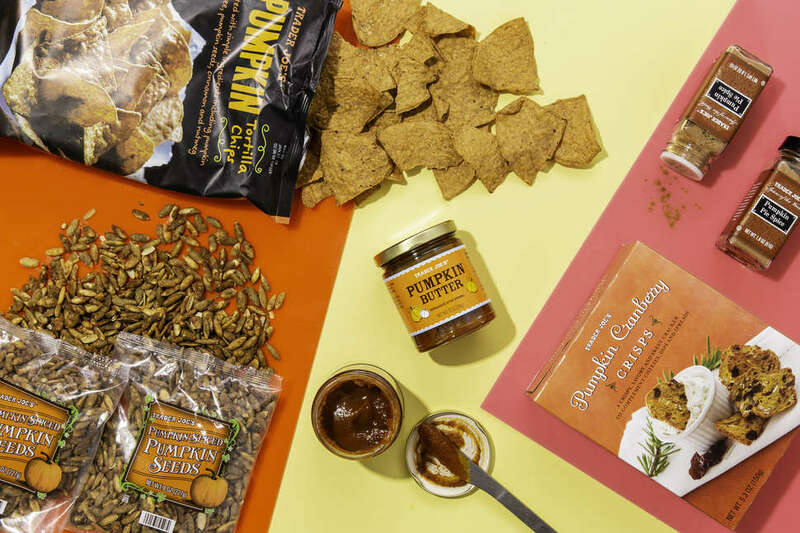 This is the essential Trader Joe’s pumpkin food you need in your life. TJ’s is a master at spices and seasonings. Case in point: its Everything But the Bagel Sesame Seasoning Blend. I use it on eggs and avocado toast, and am convinced it’s one of the best seasonings ever made, with apologies to Mrs. Dash. 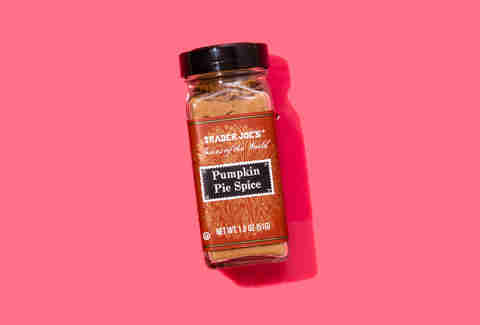 So you know that TJ’s brings it with this pumpkin pie spice. Look, if it only was good for baking pumpkin pie with, it wouldn’t be worth the $1.99. But much like with the EBTBSSB, its versatility is key. TJ’s says you can add it to oatmeal, squash, and even a bowl of cereal. Why stop there? Throw it in a cup of coffee with steamed milk, stir well, and you’ve got a pumpkin spice latte on the cheap. Corn. That’s what most tortilla chips taste like. Like eating stale corn. I’m not knocking it! I love dipping tortilla chips into guac and salsa. 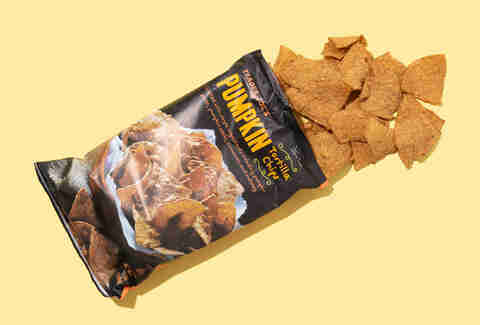 But these Pumpkin Tortilla Chips are a real shot to the bow of the Tortilla Chip Industrial Complex. They’ve got a satisfying crunch, but there’s also a bonus cinnamon and nutmeg kick. One caveat: The chain recommends you dip it into Pumpkin Greek Yogurt. I’m sorry, but I’ve never been eating a bowl of yogurt and thought, “Let me grab a bag full of Tostitos right quick!” Here’s the good news: It’s delicious paired on the side of any sandwich (especially something Thanksgiving-y like The Bobbie) or just to snack on when you’re watching weekend football. Last week, I was walking around the store talking to a TJ’s manager about the pumpkin products. We walked by the freezers, and he mentioned offhandedly that his family was in the ice cream business, and that he has a super high standard for ice cream. This Pumpkin Ice Cream makes the cut, he said. And who am I to argue with an ice cream scion?! He probably loves it because it contains 20% actual pumpkin puree, and it’s rich and decadent as all get-out. 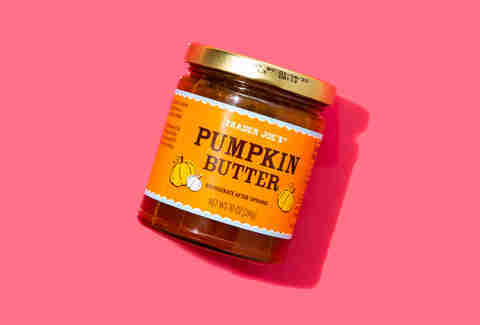 If you scooped some of this onto some pumpkin pie, you’d be ingesting so much pumpkin you might instantly turn bright orange after consuming it. 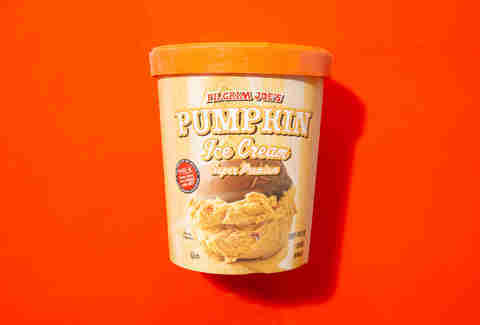 We recommend just scooping some into a bowl and enjoying those pumpkin spices in a cold, creamy format. … this one! Remember that manager guy from earlier? He paused when he stood in front of these crisps. This was the one item he said he stocks up on when it comes out because he likes to eat them year-round. The box says it’s meant to “complement cheeses, dips, and spreads” but this expert said it was all about complementing one thing: cheese. The cranberry and thyme from the crisp pairs nicely with any cheese; it’s almost like it was designed to put out on a tray for a holiday gathering. Or, if you’re lazy like me, you can shovel them into your mouth unadorned until your stomach says it’s time to quit. With more sugar than a can of Coke (45g -- a whole five more grams!) and a whole lot more Fall flava, pick up the Trader Joe’s pumpkin sweet cream cheese muffin! It delivers on the sweetness factor that such a large amount of sugar suggests, and what’s even more exciting is that you have to eat to the center of the muffin to get to that sweet, sweet cream cheese. It’s like eating a delicious cupcake crossed with the reward factor of a Tootsie Pop, and you get to call it a muffin, which sounds marginally healthy! There are no losers here when you buy these muffins. Yeah, this isn’t a Trader Joe’s-branded item. 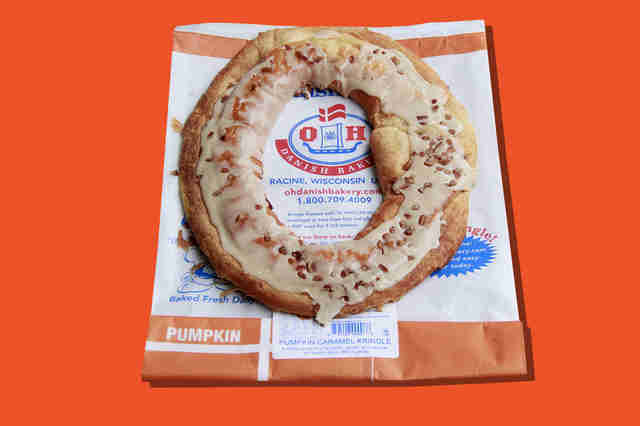 But it may be one of the few nationwide grocers where you can find this delightful, oversized pastry courtesy of Racine, Wisconsin's iconic O&H Danish Bakery, which will otherwise ship you one direct for around $30 (here it's under $10). I’d never had one before, so I was surprised when a danish in the exact shape of a toilet seat came out of the bag. I threw it in the oven for 3 1/2 minutes as instructed, and when it came out, I had the distinct pleasure of eating one of the best pumpkin-flavored pastries I’ve ever had. It’s flaky, warm, and has just the right of pumpkin spice. I prepared it as a midnight snack, but I’ve got a feeling it’s been enjoyed on a crisp fall morning with a cup of coffee. Pumpkin spice coffee, obviously. It’s easy to get mesmerized by the frozen section of TJ’s just for its sheer amount of staples: the mac and cheese, the pizza, the frozen veggies. Don’t let that distract you from the multitude of winners in the Trader Joe’s refrigerated section, including the brand new Pumpkin Butternut Squash Bisque. Real TJ’s heads know the shelf-stable Butternut Squash Soup in a box is unimpeachable, but consider mixing things up with this vegetarian Butternut Squash Bisque for a satisfying dose of pumpkin, brown butter, and sage. It’s affordable, too: 20oz is just $3.99. If you don’t buy all your nuts and seeds at Trader Joe’s, you’re missing out. C’mon, those Thai Lime and Chili Cashews are worth the trip on their own. I was happy to see that the Inception of pumpkin snacks was back for a fifth year to delight everyone with its dessert-like take on pumpkin seeds. Cinnamon, ginger, nutmeg, and allspice dust these pepitas, which are good for a quick fall-themed snack whether you’re at your desk or you’re a Major League Baseball player looking to spice up your dugout eats. The TJ’s manager I spoke to says it’s too much pumpkin flavor for him, but that’s his own fault! If you’re smart like me (and you are! 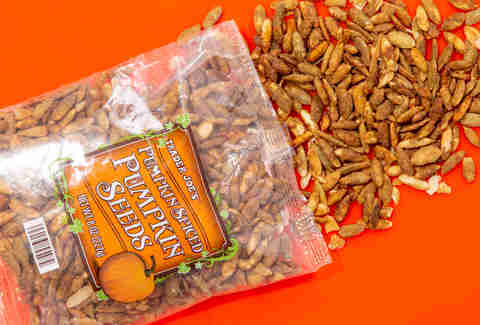 ), it’s worth adding a scoop of these to spice up any trail mix. There are few simpler meals on planet Earth than throwing a bunch of ingredients into an Instant Pot and waiting until it’s chili. But because nothing is easier than going to Trader Joe’s and throwing a plastic tub into your cart, consider Trader Joe’s new Harvest Chili! This truly filling chili includes a hearty mix of black beans, butternut squash, cauliflower, and sweet potatoes, plus layers of chili spices like guajillo and cayenne. And it gets an extra boost of fall flavors from the addition of pumpkin puree. But they’re not done! They’ve also added red quinoa and green lentils, because no one has time for a watery, disappointing chili. I eat oatmeal every morning. I’m particular about it: I want it with bananas, blueberries, and Trader Joe’s Unsweetened Vanilla Almond Milk, and I want it cooked for exactly two minutes. I tasted this product that’s been on shelves for seven straight years with high expectations. I heated a bowl in the microwave for a minute and 30 seconds and the consistency was perfect: not too soupy and piping hot. 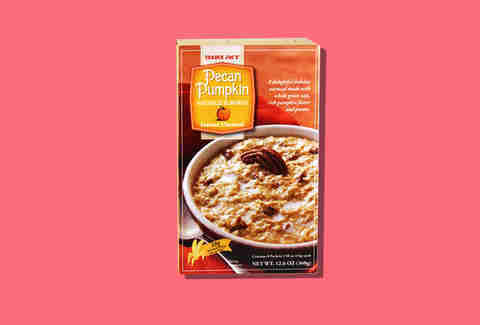 I could use more pecans, but other than that, all the pumpkin flavor you want is accounted for and present. Probably because they use real pumpkin, and add little more than sugar and oats. If you’ve ever thought to yourself, “I wish Starbucks’ Pumpkin Spice Latte had booze in it,” Trader Joe’s has the answer to your prayers. From the same specialty grocer that brought you Egg Nog Holiday Liqueur, TJ’s sneaks this limited-time booze into stores right before Halloween. Expect many of the same flavors as a PSL: not only is it creamy, but it has the requisite vanilla, caramel, and seasonal spices. Even better, it clocks in at a relatively low 25 proof (that’s 12.5% ABV -- by comparison, Jack Daniels is 80 proof), so feel free to use a healthy pour in your weekend morning coffee. 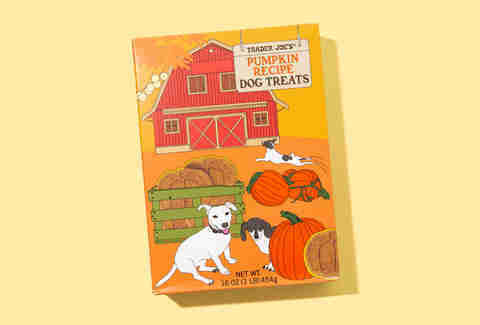 What if the highlight of every dog’s year was getting pumpkin-flavored dog treats, and we didn’t even know it?! It’s best to cover your bases. Buy a box. They beat the hell out of Snausages. Lee Breslouer is a writer and editor based in Colorado. If you prick him, he bleeds pumpkin-spiced blood. Follow him @LeeBreslouer.